Did you know that there’s bacteria in dirt that can elevate your mood? I didn’t either, but the spring after my ex and I separated, I would come home from work and head straight out into the garden to get my hands into the dirt. I didn’t know why it helped me feel better, I just knew that the feeling of my hands in dirt and on plants was soothing to my soul. And the beneficial bacteria was probably helping, too. Humans are sensual beings. But when your life is busy and you are focused on just keeping everything running and everyone safe, you aren’t noticing the sensations that are entering your body all the time. This is such a simple form of self-care, and accessible all the time - anytime. 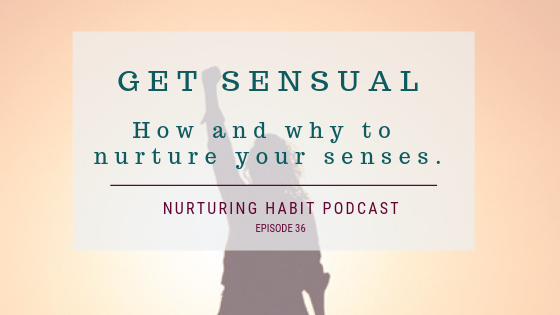 The benefit of noticing your sensations and also tuning into them is that you will feel more in your body and out of that swirling to-do list and worry in your mind. You will be more aware of what your body and your heart are hungering for, and then can take the steps to feed yourself even more deeply.It is a win-win-win process. Listen to Episode 36 now in the play bar below (reload your browser if you don’t see it). Or open the episode in iTunes. This show is also available in Google Play and in Stitcher.